Can’t possibly eat another bite? You’re likely to change your tune when faced with a slice of this creamy pumpkin cheesecake. The sour cream topping goes on at the end of the baking time. 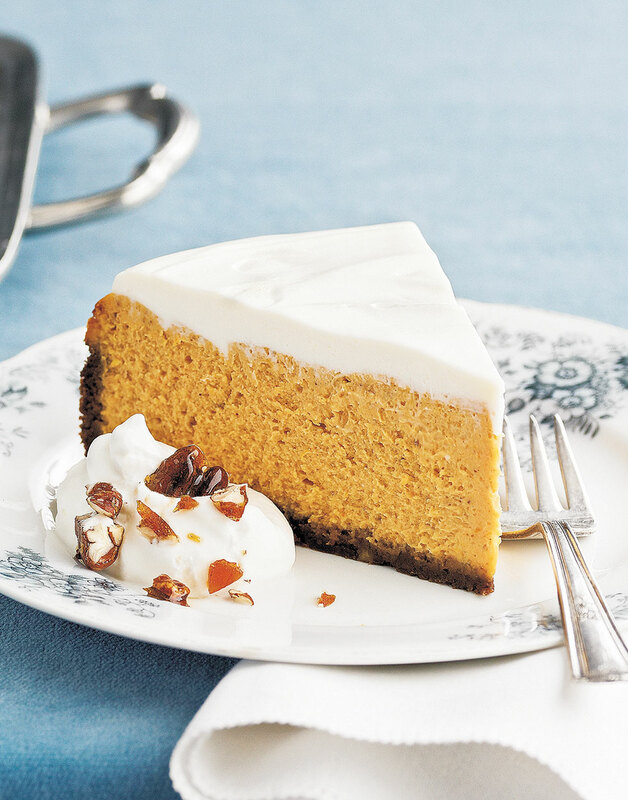 It acts as the icing on the cheesecake, adding a perfect contrast to the sweet pumpkin filling. Preheat oven to 325°. Coat a 9-inch springform pan with nonstick spray. For the crust, combine gingersnap crumbs and graham-cracker crumbs in a bowl. Add pecans; stir in butter, sugar, and salt until mixture is sandy. Press crumb mixture into bottom and 1 inch up sides of prepared pan. Bake crust until slightly golden, about 10 minutes. Remove pan from oven; cool slightly. For the filling, beat cream cheese and granulated sugar with a mixer on medium speed in a bowl until fluffy. Add pumpkin, eggs, lemon juice, vanilla, cinnamon, ginger, nutmeg, and cloves; beat until smooth, scraping down sides of the bowl. Pour filling into crust; place springform pan on a baking sheet. For the topping, whisk together sour cream and powdered sugar in a bowl; spread over cheesecake. Return cheesecake to the oven; bake until it’s set, 15 minutes more. Turn off oven and crack open the door; leave cheesecake in the oven for 20 minutes more. Remove cheesecake from oven. Allow cheesecake to cool in pan on a rack for about 1 hour. Loosely cover cheesecake in pan with plastic wrap; refrigerate overnight. To serve, remove ring from the springform pan. Slice cheesecake with a sharp knife dipped in hot water and wiped dry before each cut. Garnish individual servings with whipped cream and sugared pecans, if desired. Press the crumb mixture firmly into the bottom and 1 inch up the sides of the springform pan. After beating cream cheese and sugar together until fluffy, add pumpkin purée and spices. Pour the filling into the cooled prebaked crust. Shake the pan to level the cheesecake filling.